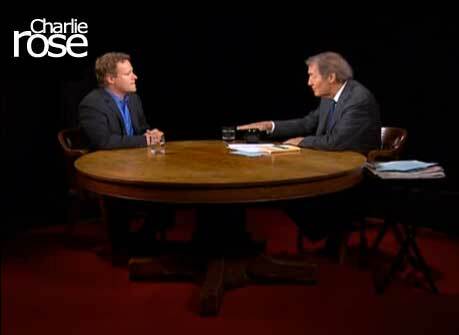 Chris Licht takes his seat at the roundtable to talk with Charlie Rose. 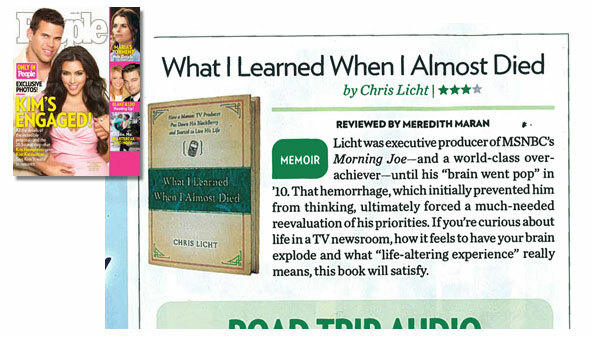 CHRIS LICHT is Vice President of News Programming at CBS. 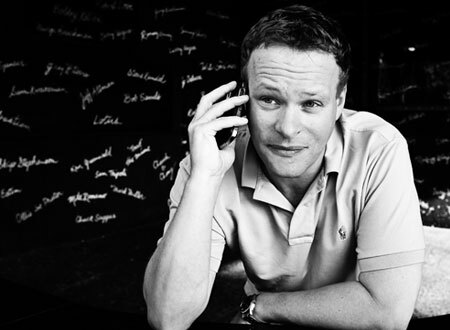 He is the co-creator and original executive producer of Morning Joe, the popular daily morning show on MSNBC hosted by Joe Scarborough, Mika Brzezinski, and Willie Geist. 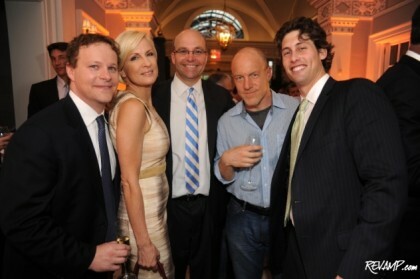 Before Morning Joe, Licht worked as executive producer of Scarborough Country and spent several years at NBC stations in Los Angeles and the San Francisco Bay Area. He lives in Manhattan with his wife Jenny and their two sons. 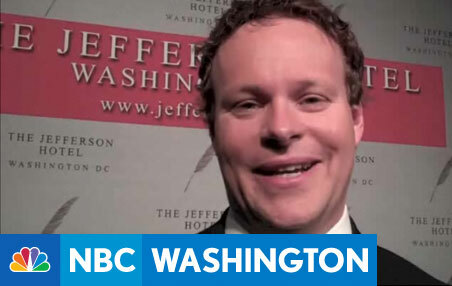 Click here to see the interview at www.msnbc.msn.com. 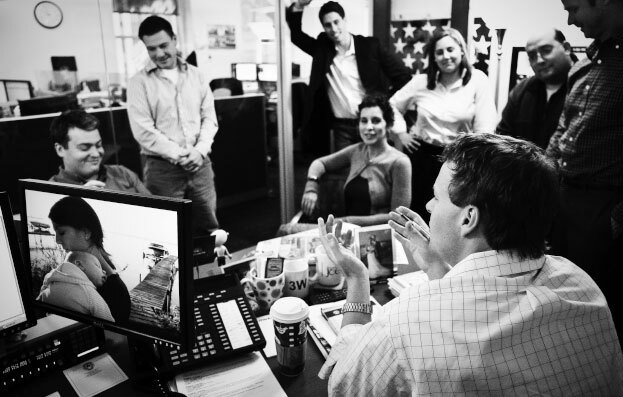 NORTHWEST — Fearless is an adjective that perhaps best describes the men and women who dedicate their careers (and sometimes lives) to reporting on the news. Be it a field reporter venturing into a war zone, a veteran news anchor questioning some of the most powerful people in the world or a behind-the-scenes producer who must somehow make it all work (and be profitable), today’s media professionals must possess the curiosity, tenacity, and daring that most abandoned in childhood. On newsstands Friday, May 27.2011. Interested in learning more about Chris? Follow him @Twitter or @Facebook. The gesture is a small one, but I didn’t used to do this. Days that were filled with the pressure and crises of running a national cable television program had little room for casual nicety. If I wasn’t in the control room producing it, I was in my office thinking about how to produce it. If the talent was unhappy, I’d let it gnaw at my gut. If somebody screwed up, I could go off like a roadside bomb, in a finger snap. I knew this. But the show so consumed me that it couldn’t be merely acceptable. It had to be great. I had ambitions. I had to be the killer producer. Then one day, with no warning whatsoever, I became scary sick in a random and hard-to-figure way, given that I was not even forty years old. Most people with the medical emergency I had do not emerge from the experience physically intact, if they emerge at all. Weeks later, my health restored, I went back to work, and was eager and happy to do so. Illness hadn’t scared me into some big life makeover. I had no urge to surrender my spot in the fast lane for ownership of a B&B in Vermont. But serious illness had recalibrated me. It had brought a trove of knowledge, as if I had involuntarily paid a painful tuition for an elite education. It was about letting go of my fears. It was about what I could control and what I couldn’t, and how people felt about me, really felt about me. It was about how to use time. It was even about Joe Biden, the vice president of the United States. It would be nice, I thought, if everyone could get the education I had gotten without having to nearly die. The man who would become my neurosurgeon doubts that a brain can make a noise. Mine did. I’m sure of it. On a cool, partly cloudy spring day not long after nine in the morning, my brain went audible, emitting a pop from deep within, not a loud one, more like a balloon had been pricked in the distance. Now came something else. It was as if a glass of water had tipped up there and spilled its contents; only this didn’t feel like a liquid, just a sensation of movement inside, from the back of my head toward the front. Now someone clamped a vise around my skull. Now someone tightened the vise with sadistic gusto, evidently striving for a pain number so far above ten it would merit a Guinness entry. My body’s inventiveness and the speed of its transformation were bewildering, and darkly impressive. In the time it takes to listen to a voice mail, which is what I had been doing, it had mustered a vicious headache. I was having a unique event, which I normally enjoy. Olympics? Worked several, loved them. Super Bowls, World Series, national political conventions, A-list receptions, book parties, movie screenings, all cool. This, absolutely not. I was suddenly in the bizarre position of thinking about what was going wrong with the thing doing my thinking. My brain was trying to diagnose its own malfunction. In any television producer’s career, especially if he comes up through local news, he usually does enough stories about “Stroke Awareness Month” or similar causes that he comes to know the warning signs by heart. I did. I ran down the list. “There’s a lot of traffic,” I said. I said this to the only other person around, the driver of a black Cadillac Escalade into whose rear seat I had dropped a few minutes before, back in my healthy era. Everything seemed to be working properly except, of course, my head. I knew where I was, on Massachusetts Avenue in Washington. I knew when it was, Wednesday, April 28, 2010. 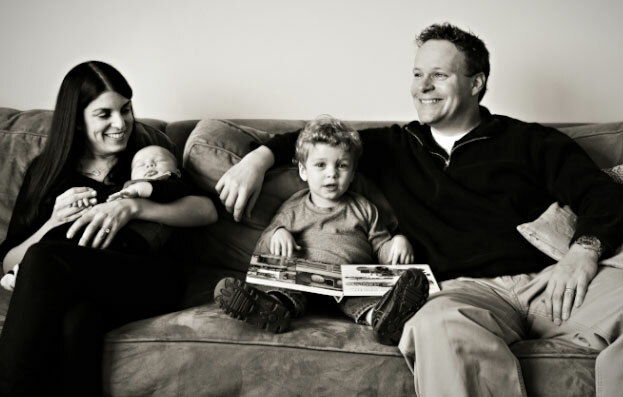 So it seemed reasonable to conclude tomorrow’s newspaper would not feature an obituary noting the passing of MSNBC’s Christopher A. Licht, 38, husband of Jenny and father of Andrew, twenty months. Which was comforting, but this still really, really hurt. In the minutes preceding the pop, I was fine. I had never been an addict, never had surgery, never been rushed to an emergency room, needed no medications, was not overweight, had excellent blood pressure, never smoked, was filled with energy and confidence. Stress? No doubt there was stress. I was in live television, from 6 to 9 a.m. Eastern, five days a week, as the executive producer of a show called Morning Joe. Everybody in television has stress. The medium overflows with its ingredients. Money. Egos. Instant ratings. Constant deadlines. But I thrived on being MJ’s executive producer. Having ruled out stroke, I was out of theories. I abandoned voice mail and dialed for help. Not to my wife, because telling her about the vise gripping my head without knowing why it was doing so would upset her without offering solace. Jenny has no medical background; like me, she’s in television. And she was in New York City, where we live, and could hardly swing by in a few minutes to commiserate in the back of this SUV. I called Dad. Peter Licht is a doctor, an internist. He and my mother, Susan, who is a physician’s associate, work in the same medical office and still live in the house in Connecticut where I grew up with my sister, Stephanie. Until now, I had never called either parent about a medical emergency that I myself was suffering. But Dad is a man of no bull and no drama, and he never coddles and never overreacts. Once, in my teens, at camp in Florida, I took a tumble while barefoot waterskiing and damaged an eardrum. A local doctor prescribed major pain meds, really serious stuff. Dad declared this was nonsense, take two aspirin. If my super-headache was nothing, he’d say so. If it was something, he’d say that. Dad didn’t answer his cell. I called the house. Mom was surprised I was in Washington because mostly we’re in New York, at 30 Rockefeller Center, 30 Rock. But Washington is where our nation keeps its national politicians and politics is MJ’s métier, so we take the show there often. Not thirty minutes earlier, we had wrapped up the day’s version and the Escalade had started back to my hotel from NBC’s Washington bureau. The show’s hosts, Mika Brzezinski and Joe Scarborough, were off to a speech. “Something’s wrong with me,” I said to Mom. I described the sensations. She was mildly concerned. As well as anyone, she knew I was never sick. She got a second call from me a few minutes later. I was beginning to have trouble moving my head in any direction, in addition to having pain. I couldn’t even lean it against the seat. Mom became more insistent. Five minutes later, it was Dad calling. He was not panicked, because he never is. He was firm. My response must have been too casual. Dad didn’t suspect anything specific; nor was he terribly worried. After all, I was conscious and coherent. What he wanted was that CAT scan, because that would be hard data, not a guess or a supposition. As for his pointed instruction to say “never get headaches” and “worst of my life,” I didn’t know, and didn’t ask, but that is an informal code within the medical profession. Any decent emergency room would interpret the phrases to mean I was not a habitual complainer, I was in the midst of something rare, pay attention, give me a CAT scan. Having visited Washington so often, I knew where I wanted to go — George Washington University Hospital in the neighborhood known as Foggy Bottom. They took President Ronald Reagan there when he was shot in 1981, a good enough endorsement as far as I was concerned. And it was a short distance from my hotel. In all probability, they would give me something to knock down the pain and I would cycle back to my room and get on with the day. There was another show tomorrow to prep for, because there always is another show to prep for, and there was a black-tie dinner that night featuring Bill Clinton and Bono. Mika and Joe were the hosts. I was going. Nothing traumatic had marred my life to that moment, and there was no reason to think the streak would end. Job, wife, kid, health, all good. Pessimism was not my default position. Setback happened to the other guy, not me. “Can we go to the GW emergency room?” I said to the driver. We were already headed in that direction. But while the busiest part of my day had ended when MJ did, the busiest of Washington’s was still unfolding. Traffic was thick. This was bad. My head was being squeezed without intermission, and now the landscape was only crawling past. Here’s the National Cathedral. Here’s Rock Creek Park. Here’s a bunch of embassies. At one point, we inched past the grounds of the U.S. Naval Observatory, the vice president’s official residence. In a couple of hours, its occupant and I were going to have a bond. By now I had new sensations. My head was pulsing with each heartbeat, and each pulse made the hurt worse. My stomach was nauseous and I was trying mightily not to throw up. I was sweating. At some point, I asked if there were any shortcuts, but there were none. I still didn’t envision the horrible, like disability or death, and wasn’t having anguished thoughts about Jenny and Andrew. But I wanted to get to the hospital and be given something to make the pain evaporate. It was making concentration so difficult that listening to more voice mails or making more calls was impossible. “I’m having a real problem here,” I said. Greet Tech said something noncommittal, like “yup.” My father’s words found my lips. Greet Tech came to life. She knew the code, even if I didn’t. “I believe you are in the right place,” she said. She wanted identification. There were forms. The reception area was not empty. Decades passed. My hands cradled my head and there arose from me a kind of low moan, an “ahhh,” because I sincerely hurt, and if that drew a little attention, great. It was actually only minutes before they beckoned me to a triage cubicle, where a nurse checked my vitals and found them normal except for blood pressure, which stood at 159 over 107. They dropped me in a wheelchair and rolled me through double doors and into the heart of the emergency room, to a small examination bay that was all fluorescence and monitoring equipment. I knew such bays. I’d been to ERs as a kid with Dad, sometimes playfully hooked up to EKGs by the nurses. My bay was curtained into halves, front and back, and each had a bed with wheels and rails. They rolled me to the back, making me the patient in C2B. Patient C2A, a woman, seemed to have fallen during a footrace that morning. I never did get the story. They told me to get undressed, put on one of those haute couture hospital gowns, and put my street clothes in a clear, plastic bag. Now I remembered that not a soul beyond the confines of the hospital knew where I was. Dad and Mom had told me to get to an emergency room, but they didn’t know which one I’d chosen. Nobody at Morning Joe even knew I was having a mini-nightmare. Jenny didn’t. Things had unraveled so quickly. It hadn’t even been an hour since the show ended. At 9:59 a.m., I sent a text to Mika Brzezinski at the Marriott Wardman Park hotel, the site of her and Joe’s speech. I wasn’t scared, really. The word was only meant to get her attention. Joe and Mika needed to know their executive producer was going to be out of touch and the reason wasn’t trivial. But my goal wasn’t to herald a huge personal emergency. Everything in my past said this would be a brief suspension of duty. The EP would be getting out of George Washington. 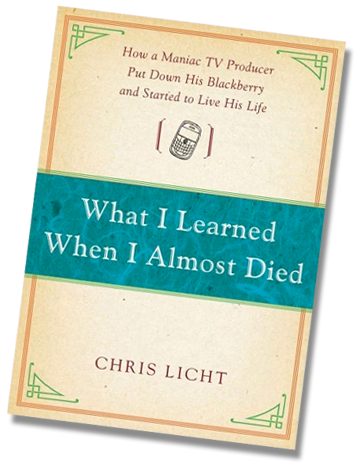 From “What I Learned When I Almost Died: How a Maniac TV Producer Put Down His BlackBerry and Started to Live His Life” by Chris Licht. Copyright © 2011 Reprinted by permission of SIMON & SCHUSTER.